Chef Alberto Morello, a proud Italian, makes no qualms about it. Elaine Morello pours an Italian beer for her husband, Alberto. 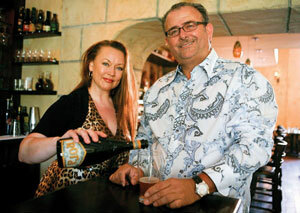 Owners of Olio Pizzeria and Olio e Limone Ristorante in Santa Barbara, they are the exclusive carriers on the Central Coast of most of the Italian beers in their lineup. Mr. Morello and his wife, Elaine, launched Olio e Limone Ristorante in 1999, and it’s become a gourmet standard for fresh, authentic Italian cuisine. But the launch just two years ago of the Pizzeria — a stylish yet rustic and comfortable enoteca and bar right next door — has best afforded them the chance to introduce their clientele to a relatively new batch of artisanal Italian brews. “Birra artigianale,” he calls them in his native tongue. Available in both eateries, they fare best in the Pizzeria, where share-friendly items include pizzas, antipasti and a wide range of cheese and charcuterie dishes, and where the new lunchtime menu features a variety of salads, egg dishes and panini. “In Italy, in the pizzerias, you mostly have beer, especially in the hot summers, and with pastas,” he says. 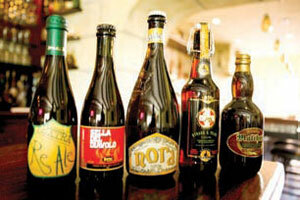 He admits that the American consumer often overlooks Italian beer for the country’s wide variety of food-friendly wines. But his goal — and it comes across as a genuine aspiration — is to have his clientele regularly reaching for beer, too. The Morellos’ lineup of artisan brews includes 10 bottlings, and the chef says 10 other unique beers will soon be added to the list. These crafted beverages don’t see any local distribution currently; in fact, Mr. Morello drives to Los Angeles about once every five weeks to pick up cases as they reach the shore. His two restaurants are exclusive carriers on the Central Coast of most every single one of these beers. But flavor may be one of the top selling points of the artisan selections that now dominate the Olio “birre” list. The chef samples five of his favorites — they generally range between 4 percent and 8 percent alcohol — as he savors warm, just-out-of-the-oven pizza bread with prosciutto and a selection of fresh hamachi, tuna tartare and homemade linguini that head chef Francesco Pesce has just brought by. The Re Del Borgo is an IPA (or India pale ale) from the Lazio region, near Tuscany. It features an intense amber color but a refreshingly light and bright mouthfeel. Its flavors of orange and caramel are most intense upfront, and the finish is clean. A 12.7-ounce bottle sells for $10. “This is one of my favorites,” says Mr. Morello as he pours the Strade San Felice Grado into a chilled glass. It hails from the Piedmont region and is an earthier drink, with a creamy head, a soft nuttiness on the nose and a slightly honeyed palate. The bottle, at 16.9 ounces, costs $13. “There’s a lot more chestnut flavor in this one,” the chef insists with the Malthus Birolla from Lombardy, located west of Verona. The beer is intense, rich and fruity, with chestnut, vanilla and caramel gracing the nose, yet smooth in the mouth and refreshing on the back end. The 12.7-ounce bottle is on the list for $14. Mr. Morello smiles as he pours the Sella Del Diavolo into a glass. “The name of the label translates to ‘the saddler of the devil,’ ” he says of the amber ale crafted in Sardinia. The beer is rich and complex, with roasted fruit and caramel notes and a smoky bitterness in the finish, yet with a light carbonation that makes it lithe in the mouth. Fourteen dollars gets a 12.7-ounce bottle. And then the beer that pleases the chef most: the Nora Birra Baladin from Piedmont. It’s made by Teo Musso, a winemaker’s son, whom Mr. Morello describes as one of the superstars of the Italian microbrew movement. Presented in a beautiful, 1?-pint bottle for $21, it’s made from organic wheat and is balanced, brilliant and mouth-filling. “This is more elegant, it has more finesse, and it’s very drinkable,” says the chef. Mr. Morello knows that price point plays a role in featuring these special brews on his menus. “Look at this packaging,” says the chef, holding up the bottle of Baladin. “Just the glass alone can cost one euro.” He says he keeps his markup slim by design; the $21 Baladin means a $2 profit for the Morellos, not counting the expense involved with driving down the California coast to pick up their shipments.